Pics and Kicks: Hinckley Challenge. Ok all y'all. I'm so loving this! As you all know the Prophet of the world and the president of our Church passed away recently at the ripe old age of 97. Some lovely human from Heaven knows where has decided to begin a challenge. . . The Hinckley Challenge. It's a challenge to read the entire Book of Mormon in 97 days. 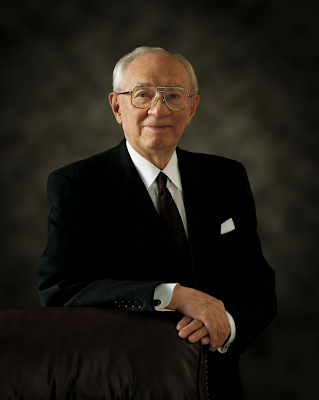 . . in honor of President Hinckley's 97 years of life. There's a website where you can register (obviously for free) and it will track your progress! I don't want to put pressure on anyone; please know that I recognize the fine line between genuine desire to share that which is sacred to my heart and solicitation of religion. I hope that each of you can sense my sincerity as I extend the invitation to join me! Whether you're a member of The Church of Jesus Christ of Latter-Day Saints or not this is a marvelous way to honor a great man who as President George W. Bush has stated among other things, "had the heart of a servant and the wisdom of a leader." A man who was honored with the Presidential Medal of Freedom for his lifelong civil contribution to this great nation. This is a call to each of us to "stand a little taller. . . to be a little better" in honor of a man who lived his life in the service of God and the world. A man who stood as a witness of Jesus Christ and called to each of us to drop our burdens at the Savior's feet and happily follow Him. A man who on two particular occasions I had the opportunity to spend time with. . . and I can tell you without any hesitation whatsoever that he truly is a man of God. A man of REMARKABLE love and kindness whos life was dedicated in it's entirety to the building of the kingdom of God. *Pass the word along! Post on your own blog. . . you can even just do a simple link back to this post if you'd like, email your friends. Let's invite anyone we can to enjoy this wonderful tribute to a wonderful man, and to invite the love of God into all our lives as we read The Book of Mormon: Another Testament of Jesus Christ! **If you need a copy of the Book of Mormon, follow this link. . . at the bottom of the page you'll see the link "Free Book of Mormon." I love it, we are excited to take the Challenge! I love it. What better way to honor our prophet!.